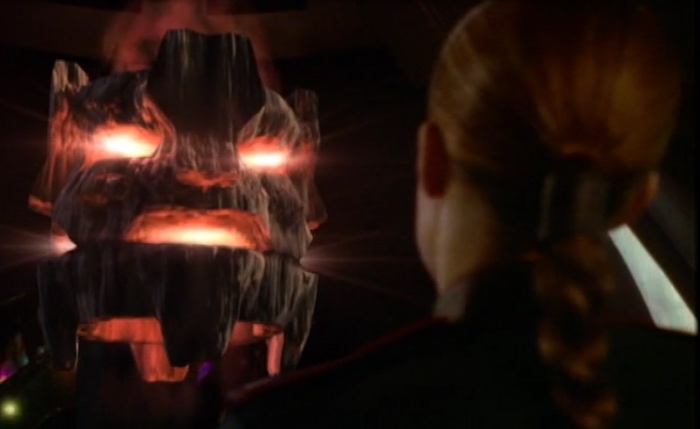 In which Tiki Gods are real, not-Aragorn REALLY gets on Susan’s nerves, a PR consultant has extreme ideas about transparency and exposure, and an intercepted phone call brings the two major plot arcs of Babylon 5 crashing together. That picture is most definitely not from Voices of Authority. Those responsible for this travesty will be sacked, and a new image will replace it after the beatings. My media player gives me the B5AG visual, the one in which some listeners have seen a face in the green shape? There’s a face in the black shape too. Yikes! There was some discussion in the podcast about the decision to find the First Ones being somewhat arbitrary, Delenn just saying it’s time and everyone else agreeing. Maybe a bit of subconscious bias here, because Delenn is a woman and not wearing a uniform? She is Ranger Number One, and the local representative of by far the most powerful of the Younger Races. Why shouldn’t she give orders?